There are a couple of sources for finding a cabinet to house your project. 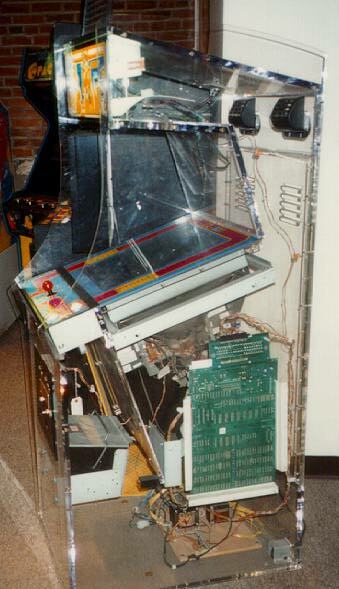 Many arcades will have an old gutted cabinet rotting in the back they'll be happy to sell or even give to you. Another alternative is to purchase a working arcade machine, from an arcade or from an auction. The advantage of doing this is you might be able to scavenge parts from the machine for your project. There are a couple of excellent FAQ's on buying arcade machines. There's the "Buying at an auction" FAQ, available at the Spies website, and the "Buying from an operator" FAQ, available at Spies as well. Also, the Video Arcade Preservation Society, is an excellent reference. Please do be mindful that we don't destroy what we're trying to re-create. Many classic arcade machines are rare and worth a heck of a lot more intact than altered. Ideal candidates for this type of project are machines that have already been abused by previous owners - artwork destroyed, poorly converted, etc... If you have a classic cabinet in good shape, you can probably sell it to a collector and get a trashed but usable cabinet in the bargain. The Dragon's Lair II site has dimensions of the Dragon's Lair II arcade cabinet online. You can use this as a guide to build your own. Brien King's Arcade Restoration Workshop has dimension for a Defender cabinet you can use as a guide as well. The MAME Cocktail Cabinet Project has dimensions for those of you thinking of building your own cocktail cabinet. Wouter's Arcade Machine has dimensions and pictures up you can use to model your cabinet after a MS PacMan cabinet. LuSiD's Arcade Flashback has fairly detailed dimensions in a PDF file you can download. Master Of All MAMEKind has plans for a mini-cabinet you can download in PDF or Tiff format. The Classic Cabinets website -- "The home of home cabinet construction." An excellent site for building your own arcade cabinet with plans, diagrams, parts lists, etc. Gold Country Woodworks also sells a plan to build an arcade cabinet out of wood. The Asylum - MAME Cocktail Project has an excellent wireframe model with measurements of the cocktail cabinet he has, and is well worth a visit if you're going the cocktail route.